Various drilling tasks are presented throughout this website. Various types of drills are used and are described below. Much of the hole-making presented on this site is small diameter work using small machines. Regular 'Jobber' type drills can be too large to use comfortably on small machine tools. For regular type drills, stub-length or screw-machine length drills are preferable. These are available in high speed steel and in a wide range of sizes. Various finishes are available, oxide, bright, or various coatings, such as titanium nitride (TiN), but choice for me is often dictated by whatever is available and at the most reasonable cost. Very small sizes of regular drills can be difficult to hold in the machine and maintain accuracy. A universal shank size is preferable. 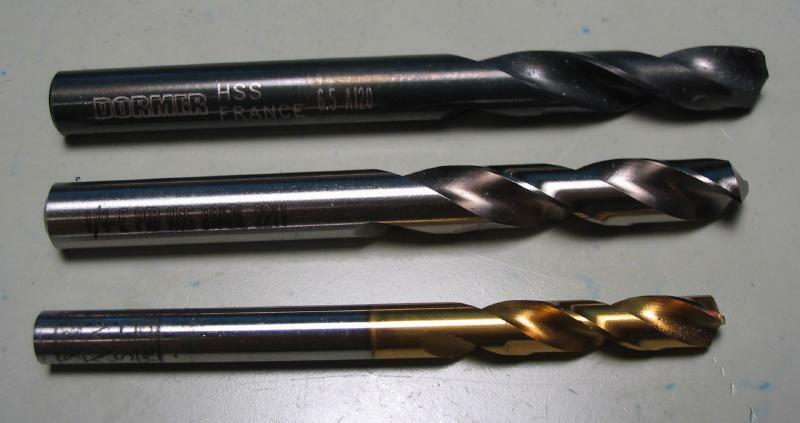 The best type of small drill are high-speed steel (HSS) or variant (e.g. cobalt HSS). 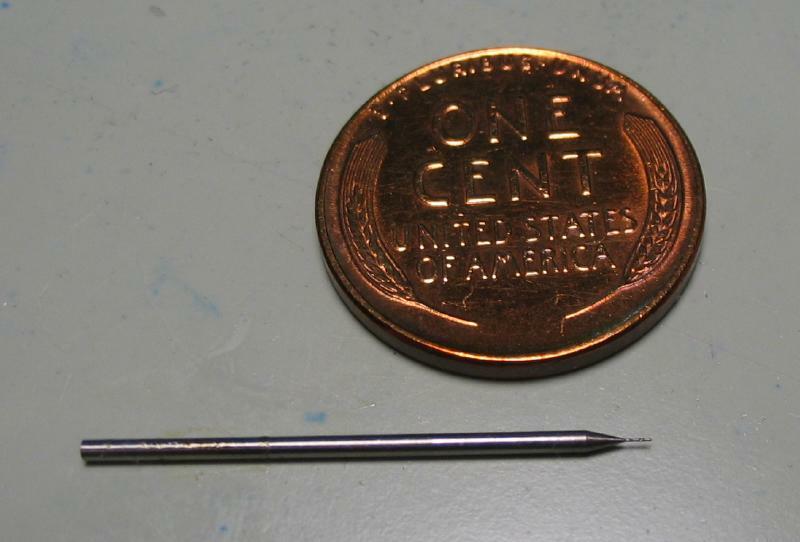 There are a couple manufacturers of small diameter drills, e.g. Sphinx-Spirec and Walter-Titex. The trouble is the cost per drill and distributors often require a minimum purchase of ten. 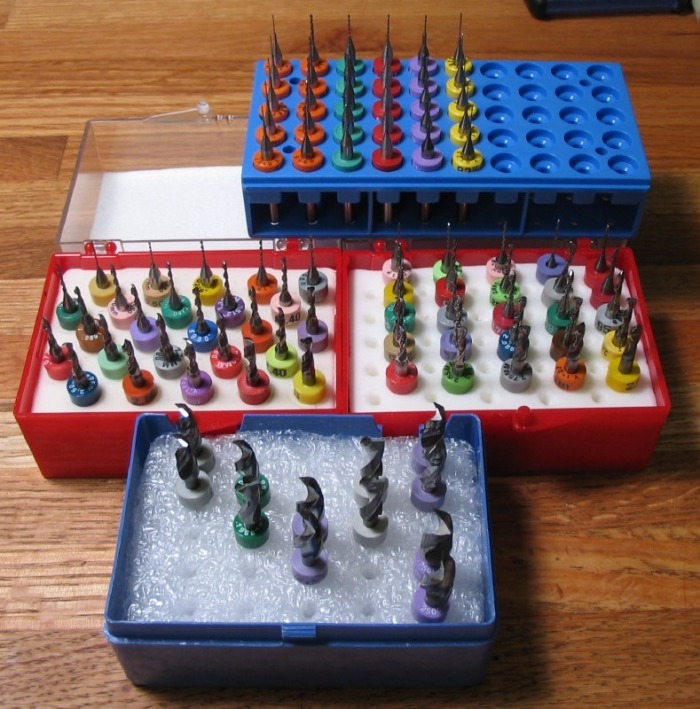 Shown is a set of 0.15mm Titex drills made in Germany. The shank is 1mm. Titex drill held in 1.0mm Schaublin collet in the Cowells tailstock. 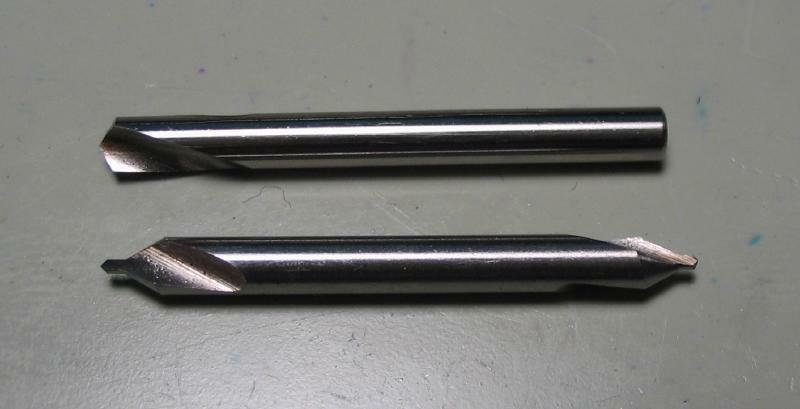 Carbide PCB-type drill bits are useful for many drilling tasks. 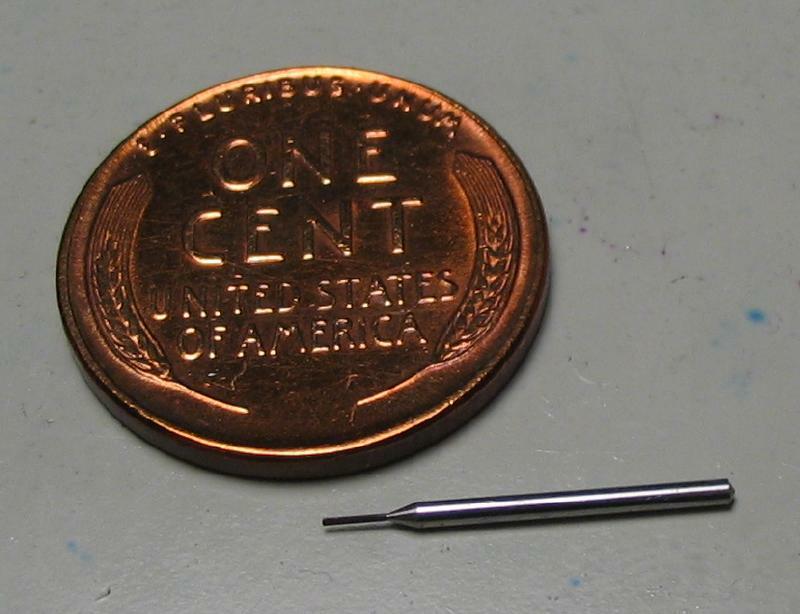 They are available in just about every imaginable size, even extremely small sizes, and have a uniform 1/8" shank (even sizes larger than 1/8"). They are also very short, making them useful on small machines and for drilling small objects. The primary disadvantage is that being made of carbide, they are fragile, and I have yet to ever dull one, they usually break or chip long before that can occur. I have been getting better at using them without breaking them, by learning the touch and feed that suits them, and also have accepted that they are somewhat disposable, and to stock up on commonly used sizes. The tray at the top are tapping drills for the smallest thread sizes, the middle boxes are 0.5 to 2.95 (every 0.05mm) the bottom are some larger sizes I needed, tapping and clearance drills for 5 and 6mm and 1/4". Not shown is a box of the very small, below 0.5mm drills. 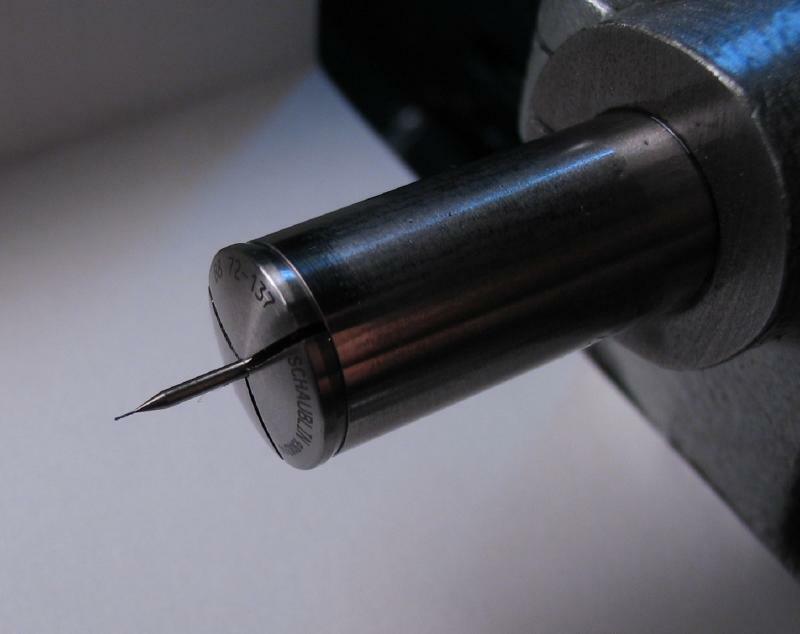 Another type of drill that may be useful in horological work are pivot drills. Very small diameters are available, and are a simple spade type drill made from carbon steel. 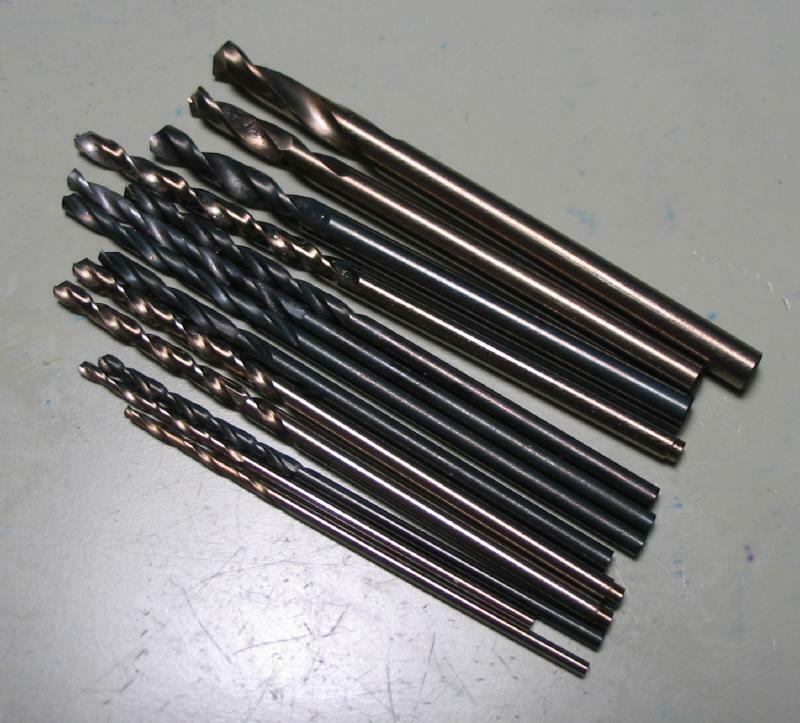 It is the type of drill that one can make from drill rod relatively easily. The set shown is offered by Bergeon (No. 1713) among other sets, and includes 0.10 to 0.28mm. To make a start for drilling a hole, a spotting drill is helpful. It is essentially a drill bit without a spiral flute, and very short length. The cutting angle should match that of the drills used, which is 118 degrees in my case. This can also be done using a combined center drill and countersink. These are intended for drilling a 60 degree center hole for turning with tailstock center support, but the short and rigid length is useful. The combined center drill and countersink drills are sometimes called Slocomb drills or just center drills. They are typically sold in gauge sizes, I find the sizes 1, 0, 00, 000, 0000, 00000 most used.